From the main menu, click RAM Disk+. 1. At the bottom '[ ] Change the location of Temporary Internet Files' if checked will be automatically set. 2. Click OK and Windows log off and then log in to verify that this internet surfing faster. OS name and memory information is displayed. Set the size of the RAM Disk. Memory size must be less than or equal to 90% of free memory. Hybrid: a combination of memory + swap file memory, the hard disk file. Lack of memory, using the first hybrid only the C: drive, create a temporary swap file on the root. At the end of the temporary file to the system swap file is deleted, and the OS virtual memory (paging file) and not related. Utilizes a hybrid of the RAM Disk, the problem of lack of capacity can be prevented. Faster than the speed of the memory, but it's the best. SCSI: Physical Disk-to-Disk Administrator to recognize real hard to get caught in any application compatibility is good. Direct I / O: Logical Disk-to-Disk Manager, etc., but some applications may not be aware, the faster the speed. Prefer not select the next depending on the intended use. When using the speed up of web surfing Direct I / O is recommended. Dynamic memory allocation: Allocates memory in sequential order. The delay at the time of the allocation. Support for hibernation mode when using invisible memory. The computer is turned off, all data in memory will be deleted. At the end of the backup data to the RAM disk and start Windows restore that function. Restore at system startup : Windows startup disk image files on the hard disk from which they were backed up data to restore. Fast startup mode : If necessary, restore the data from time to time. There is no delay when Windows startup. Mount as Removable Disk : Windows to create the Recycled or System Volume Information folders on the disk. 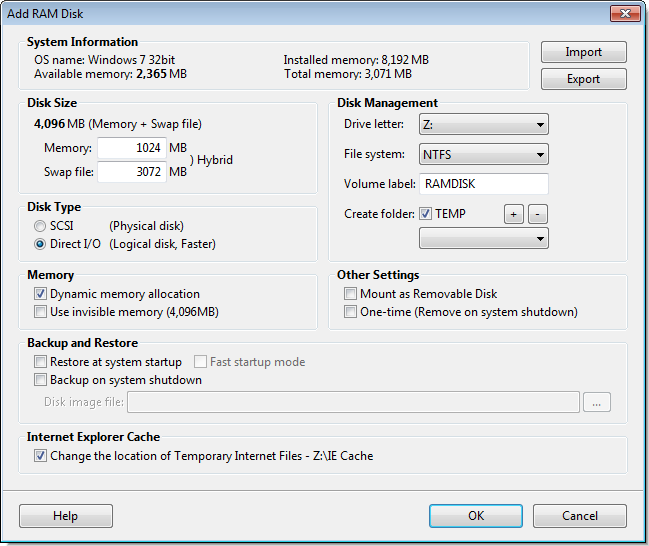 Change the location of Temporary Internet Files: Temporary Internet Files stored on the RAM Disk to be set. Disk size is 0MB and free memory is greater than 256MB, check the web surfing speed up is automatically set to fit. Setting the disk descriptor file (*.uds) export can be. Import the uds file, you can quickly set up. If you are using a drive letter on import can be excluded.